The stay was pleasant but my frustration Was that when I inquired two months before arriving as to which home I had rented, I was told the wrong one. I had expectations of staying in Seas the Day and we ended up in Beach Cabin. I was told this was because of the website I signed up on but emailed on a different site. MANZANITA BEACH GETAWAY RESPONSE: Sheri was eventually understanding and great to talk too, when dealing with the mix up. Her situation was very unique, she personally selected and booked Beach Cabin via our website, also inputting her email address incorrectly so she did not receive her confirmation. She chose to communicate with us through VRBO, another site we list our properties. The confusion on both ends came from Sheri choosing to reach out to us via VRBO on a different property than she originally booked. 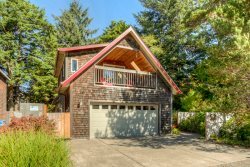 We were grateful she called us to discuss the situation so we could help her understand the process of booking a home with Manzanita Beach Getaway. We'd be happy to have her back! Even though a strong storm was passing through during the time of our stay, we loved waking up to a view of the ocean waves crashing from the master bedroom, as well as the main family room/kitchen. Having coffee on the front deck (when storm was not present) was also amazing! the open layout of the house and the fact that there are 3 king/queen beds vs. twins or bunks. We have a group of empty nest couples and it is hard to find homes without bunks or twin beds. Well stocked kitchen- had coffee bean grinder AND a salad spinner! And the decor was nice and tasteful. Not kitschy beach decor. Mu husband and I stayed at Huckleberry House in Manzanita for 9 nights over the 2017 Christmas holiday. Overall, we found it to be very clean, modern and comfortable. Communication with the host was easy and prompt. The location is in a wooded area near the State Park about a 5 minute walk to the beach. The wildlife viewing was fantastic during our stay! There are several bird feeders on the property that local birds and squirrels frequent. We saw two deer eat berries from a bush on the property at dusk on Christmas and twice we saw large numbers of Elk roaming through the town. The house itself has an open floor plan with plenty of natural lighting from the skylights. The kitchen is well stocked with utensils (and spices) for those who enjoy cooking. One reason we chose this home was because of the King sized bed, which not many in this price range have. We didn't use the second bedroom, but there is plenty of space for a group of 4 to 5 people with the two bedrooms and loft. The house was also stocked with helpful items such as paper towels, toilet paper, hand soap, laundry detergent. We did not have any issues with the WiFi connections and found the technology in the house (smart TV, blu ray player, etc) to be up to date. We would recommend this property to others and would return to stay there ourselves. Email response regarding a question for checkout was quick - thank you! Thank you. A great home. We visited Sandslot as a family over Thanksgiving holiday. We could not have been happier with the property - it was immaculate, had a fantastic view, and a great location. The kitchen was well equipped, the bedrooms were comfortable and the entire home was decorated beautifully - it was a relaxing and peaceful time. When it was stormy the view out to the ocean was wonderful (while seated inside by the cozy fire). To be able to easily walk down to the beach whenever we wanted was great. Sandslot was in a peaceful, quiet part of the community and we will certainly want to stay there again. We enjoyed the home and appreciated all the lovely amenities and appointments! Everyone was very helpful and I appreciate your excellent website and technology for checking in and checking out. You are very available for questions and to provide assistance. The house was in a lovely location and so peaceful amongst the trees. The only thing we wished for was a bigger entry so we could all get in the door and track less in with the rain and pine needles. But, otherwise, it was a beautiful and welcoming home. The beds were comfortable, too! And we so appreciate being able to bring our dog. We had such an easy relaxing time. I just loved the layout and amenities. It was over the Thanksgiving holiday and the kitchen was so well equipped. The layout allowed us and another couple to have privacy yet be able to easily socialize while cooking, watching TV and playing games. It was also such a great location. The beach was so close and so was downtown.